All 32 NFL teams will have to cut their rosters down to just 53 men come Saturday, forcing front offices across the league to hand bad news to some underperforming veterans and better news to up-and-coming rookies. Here, we dive into some of the bigger names on all 32 rosters that may be on the chopping block and highlight the bounty of overlooked players that have done enough in the preseason to avoid turning in their playbook. Williams, a three-year experiment fueled solely by the Ravens’ second-round investment rather than on-field production, may be on his way out of Baltimore. The former Minnesota product has earned sub-70.0 overall grades all three years of his career and has yet to catch more than a single touchdown in any one season. Similarly, former first-round pick Perriman may also be on outside looking in at the Ravens’ final 53-man roster. Perriman has struggled with drops his entire career, and with other valuable receivers carving out roles in the offense this preseason, Baltimore could easily turn the tables on Perriman and drop him. Ravens defenders Sieler and Young will push the Ravens’ brass to consider the livelihoods of veterans Davis and Onwuasor. Sieler, who has earned the second-highest grade among Ravens’ defensive interior players this preseason, and Young have both flashed high-level play in the teams’ exhibition games. Six-year veteran signal-caller Matt Barkley has been outplayed by Bengals’ Jeff Driskel in the team’s previous two preseason games, likely sealing his fate in Cincinnati. Driskel offers more upside as the younger component of the duo, and his mobility has been highly regarded. With veterans Tyler Boyd and Josh Malone shining both in camp and the preseason, Core has likely played his last down in Cincinnati. Core has just 17 career receptions and earned a 54.7 overall grade across 15 preseason snaps in 2018. Two special teams standouts, Fejedelem and Nickerson should push their way onto the 53-man roster with their strong efforts in the game’s oft-overlooked third phase. Both have earned 80.0-plus special teams grades this preseason while playing across all special teams units. A quad injury has sidelined DeValve all of the preseason, and in his absence, first-year tight end Devon Cajuste has exceeded expectations. Cajuste own the top-ranked run-blocking grade among Browns tight ends this preseason. Orchard hasn’t lived up to the Browns’ second-round investment in him, and with rookie Genard Avery turning heads, Orchard may be the odd man out along Cleveland’s defensive line. Avery has earned an 80.9 overall grade across 35 defensive snaps this preseason. Bostic has struggled in his first action as a Steeler, as he’s earned the third-lowest overall grade (43.9) among all Pittsburgh defenders this preseason. And, conversely, the rookie Thomas has far exceeded the expectations tied to his undrafted status this preseason, besting Bostic nearly across the board. Banner, originally drafted by the Colts in the fourth round of the 2017 NFL Draft, has caught fire with the Steelers this preseason. He has earned the second-highest overall grade (78.7) among all Pittsburgh offensive linemen across his 54 offensive snaps. Allen, a rookie undrafted tackle out of Hawaii, has simply played too well to be pushed off the roster by the veteran Sowell. Allen has allowed just two pressures across 97 pass-blocking snaps at guard this preseason, while Sowell has allowed nine total pressures in 111 pass-blocking snaps at tackle. Defensively, Edebali has been the star of the show for Chicago. The 29-year-old German-born edge defender has earned a team-high 89.6 overall grade this preseason, recording five total pressures in the process. While rookie Kerryon Johnson has rightfully earned the starting nod in the Lions’ backfield, three-year veteran running back Zenner has failed to leave his mark. The former South Dakota State phenom has earned middling overall grades his entire career, and his 62.8 grade in the preseason isn’t doing him any favors. Two-year veteran Bishop was never given the time of day with the Jets, and now three preseason games into his Lions tenure, he finally deserves it. The 6-foot-2, 259-pounder has earned the second-highest overall grade (78.7) among all Lions defenders this preseason, accruing three run stops and two pressures in the process. Valles and receiver Powell may just sneak their way onto the back end of Detroit’s 53-man roster. Valles and Powell have earned 83.7 and 83.2 overall grades through three preseason games, respectively. Safeties Rollins and Raven Greene have played similar positions on defense, as the two have both played snaps at safety, linebacker and slot cornerback through three preseason games. However, Greene has earned a much higher grade on defense (77.5) and proven more vital on special teams than Rollins. Factor in the strong play of rookie cornerbacks Josh Jackson and Jaire Alexander and the Packers’ hands may be tied with Rollins. Bouagnon, a 6-foot-2, 230-pound brick house of a back, has allowed zero total pressure in pass protection, while his backfield counterparts have struggled in that regard. With Aaron Jones suspended for the first two games, Bouagnon’s efforts may help him sneak onto the roster for at least the start of the season. Rather than keeping three quarterbacks, Minnesota may just keep their two best signal-callers on the roster: Kirk Cousins and Kyle Sloter. Tocho, the Vikings’ 2017 seventh-round pick, has earned the highest overall grade (90.6) among the team’s defenders, likely earning himself a depth spot in the secondary. Similarly, Andrews has earned the highest pass-block grade among the team’s guards (83.8), as he’s allowed zero total pressures across 28 pass-blocking snaps in the preseason. Andrews may just beat out veteran Aviante Collins for a spot on the 53-man roster. Bills tight ends Khari Lee, Logan Thomas and Jason Croom have all had outstanding preseason performances, as the trio ranks first, second and third in overall grade on the offensive side of the ball. As such, O’Leary is the likely odd man out among Buffalo’s bevy of tight ends. O’Leary has earned sub-70.0 receiving grades in each of his past two seasons in the NFL. Love and Marlowe have earned top-five overall grades on the defensive side of the ball, which could help push the two onto the roster. And the battle between undrafted rookie cornerback Levi Wallace and two-year veteran Lafayette Pitts will be hard fought, but Wallace’s potential appears to be more valuable than what Pitts has to offer. At this time, second-year Rutgers receiver Carroo’s time is running out in Miami, as his 10 career receptions and paltry 55.9 receiving grade this preseason is a gruesome combination heading into cut day on Saturday. Carroo will need to rise from the ashes in the Dolphins’ fourth preseason game if he is to keep his neck off the chopping block. Similarly, Derby has done nothing to warrant significant praise in the receiving category, earning just a 39.1 receiving grade through three preseason games. Escobar, who has earned an 81.2 offense grade so far this preseason, may be the man to take his place. The duel between Howell and Senorise Perry will be close, but the better of the pure runner of the two (Howell) deserves the nod when its all said and done. McCourty, though just a year removed from a strong 2017 campaign, may have nothing left to offer. The 31-year-old veteran has shown his age this preseason, earning an underwhelming 46.6 defense grade across 55 total snaps. The Pats will also save nearly $3 million in cap space with zero dead cap penalties if he is indeed pushed off the roster. Ulrick John, a career backup in the league, has far exceeded expectations since the injury to highly-regarded rookie Isaiah Wynn. John has earned an 88.5 overall grade and 89.4 run-block across 115 preseason snaps, ranking first and second among offensive tackles with at least 60 offensive snaps played. Burris is coming off a down year (41.6 overall grade) in 2017 and didn’t do enough in the team’s third preseason game to push second-year Portland State cornerback Xavier Coleman off the roster. Coleman earned a 74.7 overall grade in his lone preseason performance, while Burris has struggled with injuries and limped to a 48.2 grade in the game this past week. Sterling, a four-year Monmouth product who has struggled to earn any snaps in the regular season throughout his career, is having himself an outstanding preseason. Sterling owns the Jets’ highest overall grade (91.5) on the offensive side of the ball, a product of his five catches for 51 yards and four first downs. Brought in via trade this offseason, former second-round defensive interior Ward hasn’t taken to the change of scenery in Dallas. After earning sub 54.0 overall grades in each of his first two seasons with Oakland, Ward has earned just a 59.0 overall grade in 50 preseason snaps with the Cowboys. Dallas will save roughly $950K if Ward is kept off the 53-man roster. Tapper, who has earned an 82.2 overall grade this preseason, may be the man that takes Ward’s place on the roster, while Ward’s strong performance in this past week’s preseason contest may help him make the final push for a spot. Ward recorded two pass breakups on his two targets against the Cardinals last week, earning a 91.3 coverage grade in the process. Significant investment in Connor Barwin ($1.68M guaranteed) may keep a rising star in Moss off the Giants’ roster come cut day. The former Youngstown standout has had a strong preseason with an 88.1 run-defense grade, but he may just be behind Barwin and rookie Lorenzo Carter. Herzlich, a former Boston College standout who rebounded from bone cancer to pursue a career in the NFL, has fought tooth and nail every season to survive five cut days with the Giants. And his streak shouldn’t end in 2018, as he’s proven too vital to the team’s special teams units and linebacker depth all throughout his career. Becton hasn’t allowed a pressure in 53 pass-block snaps this preseason, leading to his team-high 88.8 pass-block grade. Without an abundance of tackle depth on the roster, New York would be foolish to move on from Becton on Saturday. After breaking the career collegiate rushing yards record with San Diego State in 2016, Pumphrey has done little to prove he can have similar success in the NFL. The 5-foot-9, 170-pound back spent a majority of his rookie season on the injured reserve and has yet to take a snap in the 2018 preseason. Pumphrey’s only production in the NFL was in the 2017 preseason, where he rushed for 49 yards on 26 carries (1.88 yards per carry) en route to a 49.9 overall grade. Carter has hauled in eight of his 11 targets for 141 yards and seven first downs this preseason, leading to his team-high 74.7 receiving grade. Such high-end efforts may just force the Eagles’ hand in keeping veteran Kamar Aiken off the 53-man roster. Aiken has been targeted just once across his 36 routes run this preseason, and he dropped his only target. Philadelphia will save $630K while taking on no cap space in dead money if they were to part ways with Aiken. Kelley has struggled to get back on the saddle since his successful eight-game stretch in 2016, and even with the injury to rookie Derrius Guice, Kelley’s struggles may push him out of the Redskins’ backfield. He earned just a 51.2 overall grade across 136 offensive snaps a year ago, and the hangover has carried into the 2018 preseason, where he has rushed for just 42 yards on 19 attempts (2.2 yards per carry) en route to a 50.2 overall grade. Quick may follow Kelley out the door because of his underwhelming preseason performance, especially given the success of rookie wideout Cam Sims. Quick has played in just the Redskins’ second preseason game and hauled in one catch for 13 yards in the contest, while Sims has caught 5-of-8 targets for 131 yards en route to a team-high 92.1 overall grade in two preseason games. While Sims takes Quick’s spot, Bibbs is the name to watch for in regard to Kelley’s spot on the 53-man roster. Bibbs has earned strong grades across the board this preseason, including a 74.0 pass-block grade and 75.8 rushing grade. While Miller was a recent third-round pick and has received praise from Bill O’Brien, he has been near the bottom of the league from an efficiency standpoint since the start of his career. In 2017, Miller averaged just 0.67 yards per route run, which ranked 143rd out of 158 receivers who saw at least 10 targets. 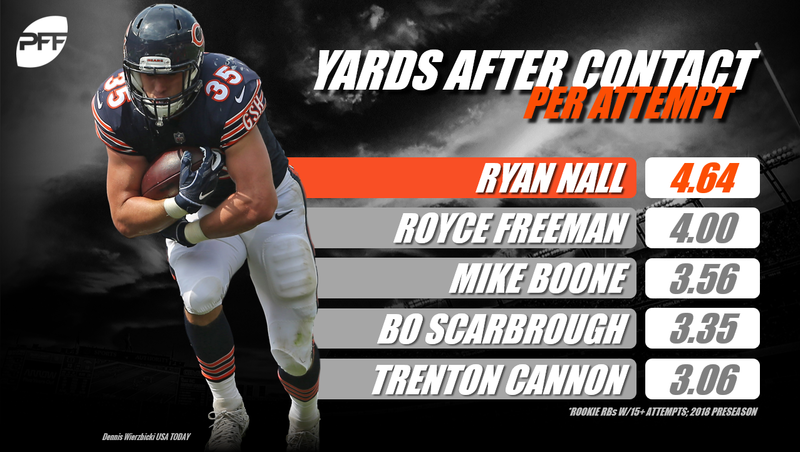 This preseason has been more of the same, as Miller currently ranks 48th in yards per route run out of 53 receivers who have been targeted at least 10 times. His inefficiency combined with the Sammie Coates signing could signal the end for Miller as a Texan. Lamm has impressed this preseason as a swing tackle, allowing just one pressure on 81 pass-block snaps. His versatility and consistency should provide a boost to a Texans’ offensive line that was desperately lacking last season. Howard has played poorly this preseason, to say the least. Thus far, his 49.4 overall grade is the lowest mark for any offensive lineman on the roster. He has allowed four total pressures on just 35 pass-blocking snaps. Combine his poor performances with an influx of young talent, and Howard could easily find himself without a roster spot come cut day. Daniels has made a statement with his play so far this preseason as his overall grade of 80.1 is good for second-highest on the team behind only Jacoby Brissett, and his receiving grade of 92.1 is far and away the highest mark on the team. More pressure on the quarterback is something the Colts need this upcoming season, and Delaire may be the solution. The veteran currently holds a 90.2 overall grade and a 91.5 pass-rushing grade, which rank second and first on the team, respectively. On just 26 pass-rush snaps, Delaire has generated two sacks, two hits and one hurry. He has been very effective, and his play suggests that he could give the defense a boost when getting after the quarterback. Siliga has been a steady performer for the Jaguars this preseason. He currently sits with an overall grade of 74.5, the best mark of any interior defender for the Jaguars not named Malik Jackson. Pair Siliga’s solid play with Jones’ lackluster preseason (47.4 overall grade), and there is plenty of reason to believe the Siliga has played himself onto this roster. Payne is the highest-graded defensive player for the Jaguars this preseason and could push his addition as a quality depth linebacker behind their standout starters. He’s a capable, two-dimensional player, as evidenced by his seven tackles and five stops along with his 91.4 coverage grade. There are two good reasons why running back Wilds makes the Jaguars roster for this season. The first is that his 69.0 overall grade is the fourth-highest of any Jaguars offensive player this preseason. The second is that veteran Tim Cook has played very poorly, finishing with an overall grade of 50.8 and a pass-blocking grade of just 11.0 to go along with a 2.7 yards per carry average. The Titans have been searching for depth at tight end behind veteran Delanie Walker, and Firkser is proving that he can be a quality option for the team. Firkser was the highest-graded tight end for the Titans this preseason and demonstrated his ability as a pass-catcher (75.1 receiving grade) and as a pass-blocker (73.4 pass-blocking grade). He is a prime candidate to steal Stocker’s roster spot, as Stocker has posted a lackluster overall grade of 49.3, only to be outdone by his abysmal pass-blocking grade of 25.4. Warmsley has earned an 80.2 overall grade and a 90.0 run-defense grade this preseason, the latter of which being the highest of any Tennessee defender. He has also shown his value to the team as a pass-rusher, generating five total pressures in his 66 pass-rushing snaps. Warmsley appears to be coming into his own, and the Titans would be wise to take advantage. Wide receiver Devin Gray could surprise some people and make the roster over the veteran Hardy. It has been a tale of two preseasons for these receivers, as Gray enters the final week of the preseason as the highest-graded offensive player for the Falcons and has impressed with his run-blocking ability (88.5). Meanwhile, Hardy is one of the lowest-graded players for the Falcons and was horribly inefficient as a receiver last season, coming in at 82nd of 87 in yards per route run (1.10) among receivers with at least 25 targets. Pasztor could find himself just barely sneaking into the final 53-man roster for the Falcons. In his limited action this preseason, Pasztor has earned an 87.3 pass-blocking grade and allowed just one pressure on 42 pass-block snaps. The Falcons could raise some eyebrows if they choose to part ways with linebacker Riley, but when you see who would be taking his place, it becomes a little less surprising. The rookie Celestin has played lights out this preseason, affecting the game in every facet. Celestin has played just 67 total snaps, yet he has produced four pressures, 11 tackles and eight stops. His overall grade of 85.8 ranks third on the defense this preseason, and he graded as above average or higher in every category. The Panthers have a tough choice to make in the battle for the backup quarterback position. 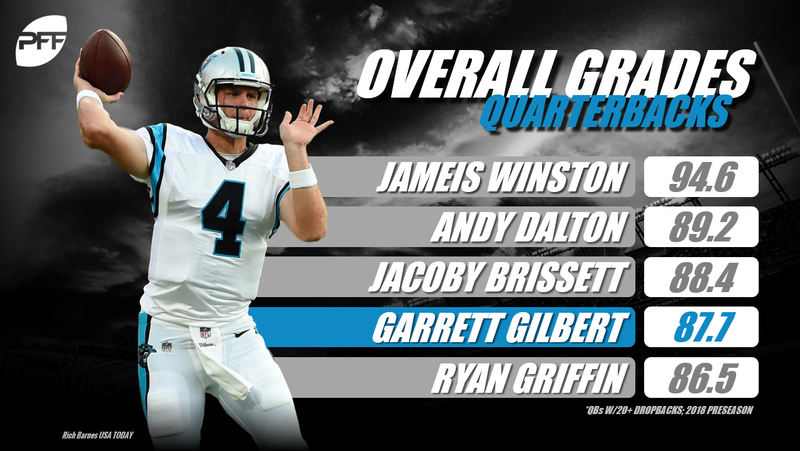 While Heinicke is the favorite to land the job in some circles, we believe that Garrett Gilbert gets the nod instead. While Heinicke has earned a 74.4 overall grade this preseason, Gilbert has outplayed his competition and posted an overall grade of 87.7. Gilbert has also impressed with his throws downfield. On throws of 10-plus yards this preseason, Gilbert is 6-of-7 for 104 yards and two touchdowns. Seymour hasn’t played well this preseason, earning just a 44.5 overall grade. It’s because of this that second-year defensive back Corn Elder may end up stealing his roster spot. Elder has performed admirably this preseason, as shown by his 77.6 overall grade and 81.3 coverage grade, the latter of which is the second-highest mark for any Panthers defender. The Panthers have been plagued by injuries to their offensive line already this season. Thankfully, they have players like Johnson to try and help fill the void. Johnson is currently the second-highest graded offensive lineman for the Panthers, and graded out as above average in overall grade, pass-blocking and run-blocking, as well. He has yet to allow a pressure in his 21 pass-block snaps and should provide vital depth to a Panthers team hoping to make a run this season. The Saints’ second-round investment in edge defender Kikaha in the 2015 NFL Draft likely won’t keep the former Washington product on the roster any longer. Kikaha has been a major disappointment for the Saints’ defense, as he’s been unable to have a positive impact at the line of scrimmage or at off-ball linebacker. He has also earned sub-60.0 pass-rush grades in each of the past two seasons and through three games this preseason. Phillips is looking more and more likely to make the Saints’ 53-man roster quite possibly due to his solid play this preseason and a lingering injury that has kept Hommanawanui sidelined through the preseason and possibly off the roster altogether. Phillips hasn’t demonstrated much in the receiving game, but he has shown that he can be a quality blocker in both the passing game (76.5) and the run game (74.3). Carr has stood out this preseason, catching all six of his targets for 75 yards and earning a receiving grade of 80.0 in the process. His 12.5 yards per reception and 31 yards after the catch demonstrate his versatility as a weapon downfield and after the catch. Rodgers’ time with the Bucs may be coming to an end thanks to his mediocre production and the emergence of Dare Ogunbowale. Rodgers has produced an overall grade of 53.7 and a pass-blocking grade of 43.1, which pale in comparison to the performance of Ogunbowale. The second-year back has impressed this preseason as a receiver (13.2 yards per reception) and pass-protector, earning grades of 90.8 and 80.2, respectively. Ogunbowale’s upside and production make him the more attractive option to keep over the plodding veteran Rodgers. The Buccaneers are in desperate need of pass-rush help after generating only 22 sacks total last season. Enter O’Connor, who has excelled at putting pressure on the passer this preseason. He enters the final week of the preseason with a pass-rush grade of 87.8, which ties Gerald McCoy for the highest mark on the defense this preseason. The Paxton Lynch era in Denver should come to a close on Saturday. The former first-round pick has botched every opportunity he’s received in regular season play, and there’s been little to no signs of improvement this preseason. Lynch has earned just 52.1 overall grade across 62 preseason snaps, most of which coming against backups. Second-year Ole Miss product Chad Kelly has earned his spot as the team’s No. 2 quarterback behind Case Keenum. The rookie running back Lindsay, a local prospect coming from the University of Colorado, has forced himself onto the Broncos’ roster with his strong play as a receiving back and special teams ace. He has caught all four of his targets for 58 yards and a touchdown while earning the highest special teams grade (69.9) of any Denver running back. Parker’s strong receiving grade (81.1) will help push veteran Traylor off the roster, and Kerr has earned the highest overall grade (89.9) of any Broncos defender this preseason. Springs, a rookie from Oregon, has earned an 80.1 run-defense grade and allowed just two receptions for 25 yards on four targets. Conversely, the Chiefs’ recent free-agent signing Amerson has carried his downward trend from a year ago into the preseason, earning the second-lowest defense grade among the 132 cornerbacks with at least 60 defensive snaps. Kansas City would take on roughly $600K in dead money if the team were to cut Amerson, but it could be considered an investment in the future (Springs). 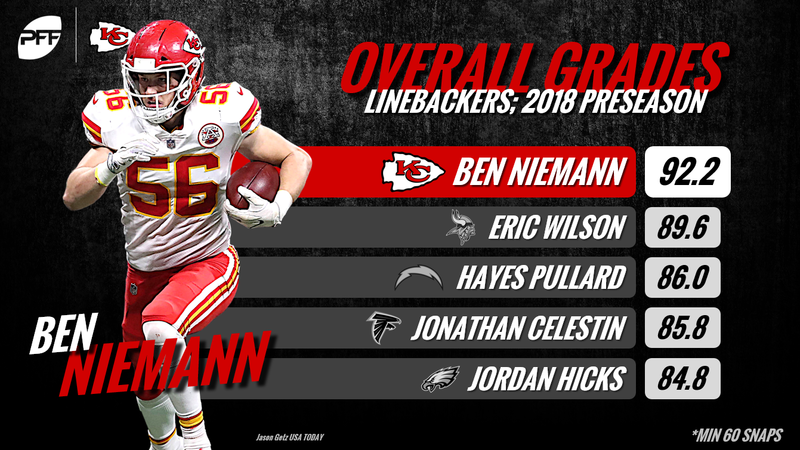 Niemann and McGil have been the Chiefs’ two highest-graded defenders this preseason, all but guaranteeing their spots on the final 53-man roster. Patton has played 64 offensive snaps this preseason, but the results haven’t been pretty. He has earned just a 60.7 receiving grade across 48 passing snaps and earned a 52.6 passer rating when targeted. Richardson, signed as an undrafted free agent this year, has impressed early in the preseason. The former Minnesota standout has earned a 76.1 overall grade across 70 preseason snaps largely because of his presence in run defense, as he has recorded three run stops in just 28 snaps against the run. Potential surprise cut(s): RB DeAndre Washington, DI Mario Edwards Jr. The success of Raiders rookies Maurice Hurst, PJ Hall and Arden Key will make things difficult on the team’s brass when it comes to the future for the former second-round pick in Edwards. He has struggled with injuries all throughout his career, and his high-end play has been limited to sporadic bursts over the past three seasons. If the team can’t find a suitor for Edwards via trade, his time in Oakland may come to an end. Washington may land on the injured reserve or completely off the team after having knee surgery last week, especially given how much the team values Jalen Richard, Doug Martin and rookie Chris Warren II. With questions marks at both tackle spots, the Raiders can’t afford to let Silberman go following the preseason. In addition to having experience at multiple positions along the offensive line, Silberman has outperformed his teammates across the board through three preseason games, earning team-highs in offense grade (79.0) and run-block grade (82.8). Ateman and Cowser will have a harder time fighting for the bottom-of-the-barrel spots on the 53-man roster, but the two have too much potential to move on from right now. Known to be a preseason superstar, Capi may finally have his opportunity to graduate from the preseason and earn playing time during the regular season in 2018. Despite improving his overall grade in each of the past four preseasons, Capi has played just 88 defensive snaps in regular-season action (all in 2017) in his four-year NFL career. 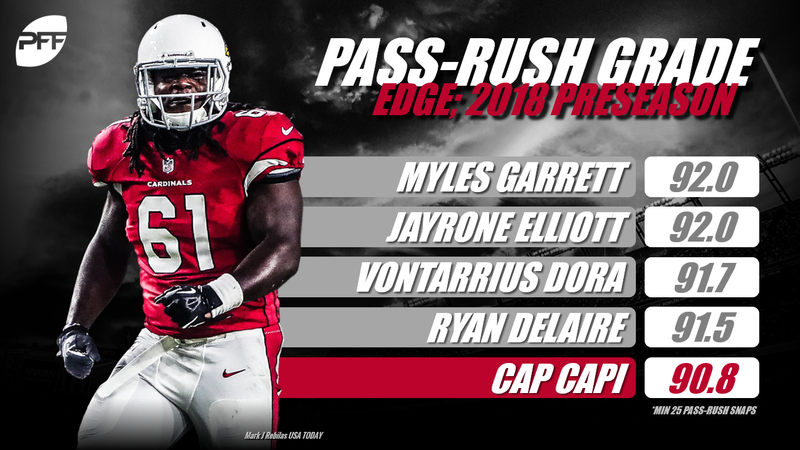 Through three games this preseason, Capi has earned an elite 90.8 pass-rush grade, which ranks second among the 75 edge defenders that have logged at least 40 pass-rush snaps. The Rams’ undrafted rookie wide receiver in Hodge may have played well enough this preseason for Los Angeles to pull the plug on 2017 fourth-round pick Reynolds. 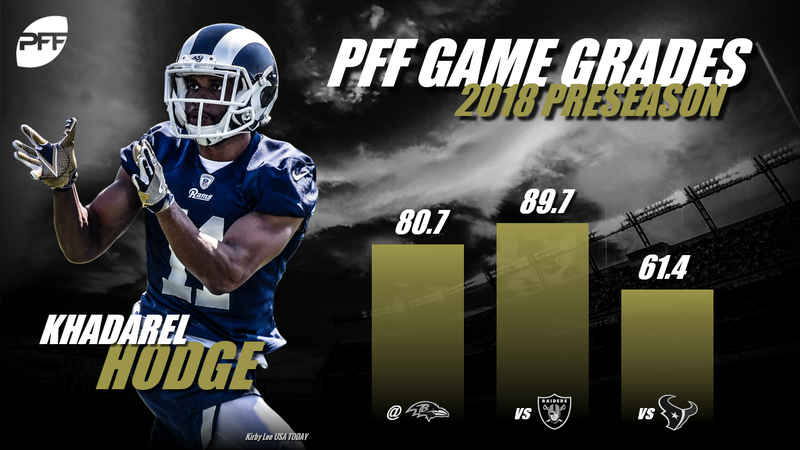 Hodge has earned the highest receiving grade of any receiver in LA and flashed big-play potential, while Reynolds has battled injuries. In addition to Hodge, another rookie playing his way to a spot on the Rams’ 53-man roster on is Holley. The former Kent State product has earned an 83.9 overall grade and the top-ranked special teams grade through three preseason games. Hikutini, though he has performed well in his considerable special teams role, may lose his spot on the 49ers’ 53-man roster given his teammate Cole Wick’s strong performances in the team’s previous two preseason games. Wick has earned strong run-block (75.0) and pass-block (75.5) grades this preseason while also hauling in two passes for 21 yards. Hikutini, on the other hand, has struggled in pass protection (26.3 pass-block grade) and as a run-blocker (43.5 grade). Jones and Day, two of the team’s young defensive interiors, have earned 90.6 and 83.6 defense grades, respectively, across significant snap counts this preseason. Regardless of how San Francisco makes room, both Jones and Day belong on the final 53-man roster. Beavers, a second-year Western Michigan product, has proven too valuable in pass protection to let walk, especially if Roos is given the nod ahead of him. Beavers has allowed just one pressure across 46 pass-blocking snaps and earned an 84.4 pass-blocking grade this preseason. Roos, on the other hand, has allowed seven pressures in 73 pass-blocking snaps and has little experience in previous years to push him ahead of Beavers. Ford has earned an 83.4 overall grade across his 71 preseason snaps, ranking second among all Seahawks defenders. 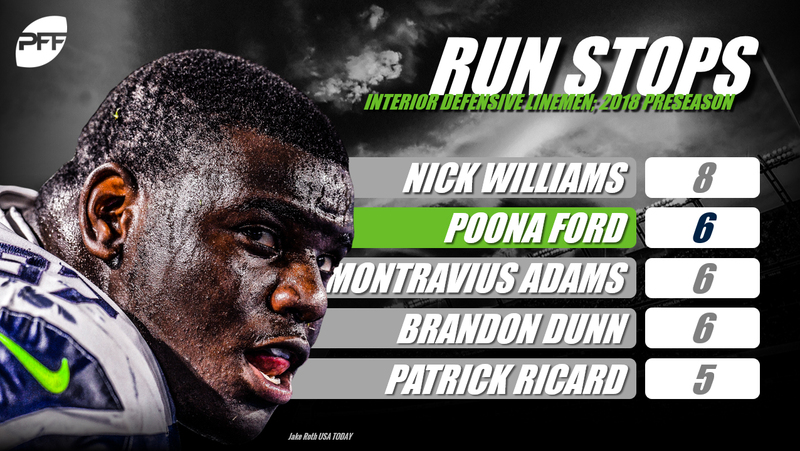 While other Seattle defensive interior linemen have played well, Ford’s play has been strong enough for the team to find a way to keep him in the building.